CHARLEVILLE’S Fr Peter Doohan spent the past week as a guest at the local Anglican rectory while his presbytery dries out in the wake of floods which have devastated towns throughout Queensland’s south-west. A piece of soggy carpet underlay from St Mary’s presbytery was one of the symbols at an ecumenical service held last Sunday in Charleville’s All Saints’ Anglican church. 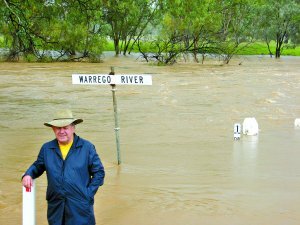 Fr Doohan’s presbytery, as well as St Mary’s Church and school, were all inundated by two separate floods on March 2 and 4 when the Warrego River overflowed and water from Bradley’s Gully surged through the town centre. Despite much destruction, Fr Doohan said there was also a sense of the “biblical image of the flood where things are wiped out and cleaned up so that renewal can once again begin”. Charleville was the worst hit of south-western towns including Roma, St George, Quilpie, Cunnamulla and Mitchell in the region’s biggest flood in 120 years. Premier Anna Bligh has travelled extensively throughout the stricken region and Bishop William Morris will be visiting affected towns, which fall within the Toowoomba diocese, this week. No other reports of significant damage to Church property were received, although Roma’s Fr John Maher said many parishioners had been severely affected. He spoke of one family at Glenmorgan who had lost all of their dams and were facing “a very worrying future”. Toowoomba diocese’s Catholic Education Office reported early in the week all schools, apart from Charleville, had escaped flood damage up until then. Director John Borserio said damage at Charleville’s school had been considerable, especially at the Prep block. “St Mary’s School has been closed since March 2,” he said. “Principal Donna Maxsted and staff will meet today (March 8) to re-assess their situation and to plan a possible time line to re-open school. Mr Borserio said “fortunately the water had not risen as high as expected in St George”. “Principal Peta Wade and staff spent Friday moving furniture and books to higher parts of the school buildings. Schools including those at Quilpie, Roma, Cunnamulla and Mitchell were above floodwaters and thus undamaged. Impacts would be on students isolated on properties and unable to travel to schools. Fr Doohan said he had been visiting Quilpie to celebrate Mass on Sunday, February 28, when the flooding rains had first started. “I was relieved to be able to get back to Charleville on the Monday, but the rain was very heavy and, throughout the night, water could be heard rushing through Bradley’s Gully,” he said. Since then Fr Doohan said he had been “a special guest at the Anglican rectory enjoying the hospitality of Fr Charlie Murry, his lovely wife and their two children”. Fr Doohan said it was the second time in his six years at Charleville that Church property had been flooded. He said a working bee would be starting on Wednesday (March 10) at the church and he hoped Mass would be celebrated there today (March 14). “I’ve also been speaking to the school where teams have been constantly working to clean up the mess. However, Fr Doohan said it may take “at least a month” before he could return to the presbytery. He expected to be at the rectory until this weekend (March 14) and would then consider other offers of accommodation. He said no parish records had been damaged. Fr Maher said he had only just returned from the Holy Land when the flood struck Roma. He was preparing to visit parishioners to offer support after being laid up with thrombosis. “I came back on the night of Saturday, February 27, … by Tuesday the rain had started and didn’t stop for several days,” he said. Fr Maher said all Church property at Roma was safe, being at the high end of the main street but the real worry was about the devastation on outlying properties. “The crunch will come when people start to comprehend the scale of the destruction,” he said. Meanwhile the St Vincent de Paul Society Queensland has announced the launch of its Western Queensland flood appeal. The society’s Charleville store had about half a metre of water through it and any undamaged stock was given to the Lifeline store. Newly elected state president Brian Moore urged the public to get behind the appeal, which will help provide financial and material assistance to people in crisis. “Many of the communities in the west, Charleville, Roma and St George, are struggling families, and isolated elderly,” Mr Moore said. “Hundreds of families have lost everything, and they will be turning to Vinnies to help get them back on their feet and replace these necessities when the clean-up begins. “We need to be there for them, but we can only do that with the financial support of the public. To make a donation to the Western Queens-land flood appeal, visit Vinnies.org.au, call 13 18 12 or send your donation to PO Box 3351 South Brisbane, QLD 4101. Archbishop John Bathersby of Brisbane has also launched an archdiocesan appeal and is urging parishes to conduct a leaving collection this weekend.